Toni is no Rookie. This author is the best! Soooooo, yeah...Every book of hers I read simply reminds me why she is my favorite author! In this standalone, there is a beautifully delivered message about how it is important to not be too quick to judge others....And we all get to absorb that important message while laughing out lout way too many times, being aroused more than I like to admit (because, HELLO GUS THE BUS!! ), crying over Bo's past (yup, gutted me), and being surprised every other page by something hilarious and completely unexpected. Bo's initial dislike of Gus and the way she slowly but surely lets her guards down is so well written. Toni Aleo has a way to leave us hanging as to why the characters are a certain way and believe me when I say that she is a master at making us FEEL for her characters. All in all, another book of Toni Aleo's makes its way in my top five reads for this year. Excellent book and my favorite in the Misadventures collection so far. 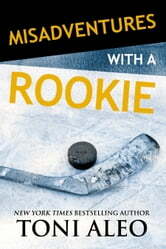 I am not a sports fan, but I love hockey romance and Toni Aleo does it well. Gus and Bo have such a great chemistry and when she gets hurt and he pitches in to help her... loved that. The chemistry between them and all of the other characters just made this such a fun story. 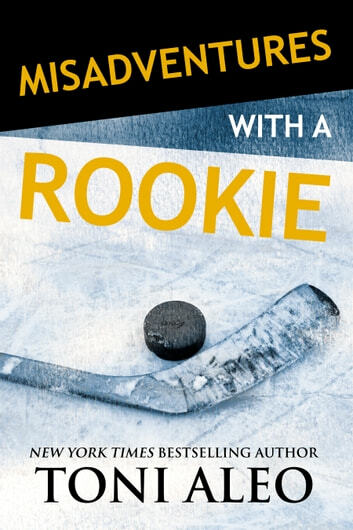 Toni Aleo lights the lamp with MISADVENTURES OF A ROOKIE. Malibu Suns hockey player, Gus Persson, is not used to being turned down. Sun’s ice girl/sports therapist, Bo St. James, has no problem shutting down the cocky defenseman, or does she. This contemporary sports romance is suitable for adult audiences. I loved MISADVENTURES OF A ROOKIE. The characters were likable and well developed. I appreciated the similarities between Bo and Gus’ mother. I loved the banter between Bo and Gus. I enjoyed the conversations with Gus’ parents. Many of them were highly amusing; others were serious. Gus is a great guy. He is not what Bo expected. The characters go through a lot in this story. It is understandable why Bo is initially weary of Gus. The two have amazing chemistry and grow throughout the novel. The plot was skillfully executed. There are some wonderful life lessons and viewpoints throughout the story. I found all the ER visits interesting. The ending was perfect. MISADVENTURES OF A ROOKIE had a different feel then Toni Aleo’s Assasins series and Bullies series, but I loved it as much as I do her other novels. Fans of Toni Aleo will not be disappointed. I voluntarily reviewed an advance reader copy of this book. Everyone LOVES Gus ‘the Bus’ Persson! His ice hockey skills are off the scales, and so are his other skills... with the ladies, lol! He's known for being quite the player. So, it's a bit of a shock to him when one particular girl that's caught his eye – Bo St. James – wants nothing to do with him! Gus repulses Bo – she’d rather eat dirt than be another notch on his bedpost. The thing is though, behind all the nasty looks and snide remarks she throws his way, much to her annoyance she's actually really attracted to him! BUT, she's fallen for someone like Gus before and she doesn't want to go down that road again! It's extremely hard to ignore the heat between them though, and it's not long before Gus has gotten under Bo's skin. Omg! This book is one you HAVE to read. I loved it! Bo is so sassy and quirky and Gus is just so full of himself! (But you soon forgive him that), lol! This is my first Toni Aleo read, and I instantly fell in love with her style of writing. I can't wait for her other book in this series – Misadventures with a Manny – due for release October 9th, 2018. I voluntarily read and reviewed an advanced copy of this book. All thoughts and opinions are my own.